Falkirk is a residential neighbourhood in Hamilton, Ontario, and is comprised of the Gilkson, Falkirk East, Carpenter, Falkirk West and Gurnett areas. 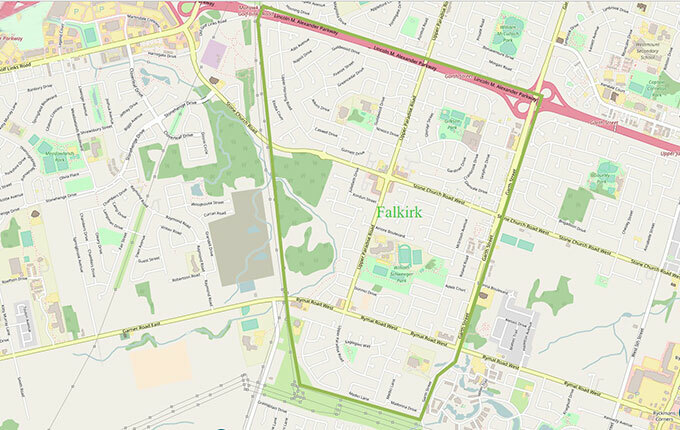 Falkirk borders on the other Hamilton Mountain West neighbourhoods of Westcliffe, Rolston and Gurney, as well as Hamilton Mountain East’s Glanbrook, and Ancaster’s Carluke and Meadowlands. Bordered by Lincoln M. Alexander Pkwy. in the north, Garth St. in the east, Medici Ln. / Hawkswood Trail in the south, and Glancaster Rd. / Stone Church Rd. in the west, Falkirk has many strengths, including greenspaces such as Shawinigan Park, William Schwenger Park and Gilkson Park. For families with children, there are also many schools in Falkirk; St. Thomas More Catholic Secondary School, the Stoney Creek School of Art, R.A. Riddell School, and St. Vincent De Paul Catholic Elementary School.